One thing I love about Germany is the fact that mega-marts and giant supermarkets will inevitably have a food stand or two nearby. (Giant supermarkets, of course, are yet another reason I love Germany). Once you've spent a good few hours shopping through the endless aisles at MediaMarkt, Aldi, or Real, you'll start to feel a bit peckish. I always chose something small and snacky for myself, as you can see below. However, fear not if your hunger is larger - doner kebabs, Fleischkaese bread rolls (thickly sliced meat with a fantastic sausage flavour), fries, and more are also available. I even saw one van, full of dozens of whole roast chickens, slowly turning on spits and getting delightfully, stickily bronzed. Impressive, I know! 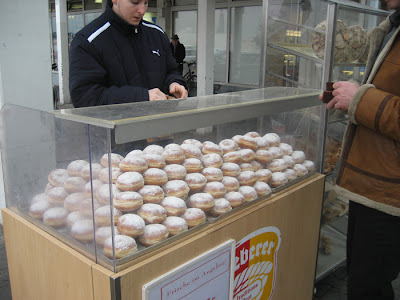 In the first photo of this post, you can see a gigantic pile of Berliners (jam donuts). I could have just bought 1, but they're cheaper (per donut) if you buy 3. As Dr. Zoidberg would say, I'll take 8!!! As much as I love Berliners, I cannot live on donut alone, so here are some other snacks I had whilst in Germany. Or my favourite, Quarkinis. These are mini donuts, containing Quark (German cottage cheese) in the batter. I do believe that the acidity of the Quark is what makes these little donuts so tender. They're about 2 euro for 5 at any bakery, and dangerously easy to eat. Quarkini und Kaffee. The breakfast of champions. On a little aside, I'm on a self-imposed detox this week (no coffee, no coke, no chocolate, no junk food and so on). I could really, really, go for some donuts right now. Hell yeah the detox is hard!! And it's not even a proper detox. I've just avoided coffee, tea, chocolate, alcohol, and sugar for the week. Seriously, by the second day without coffee, I was so cranky I wanted to STAB people. I feel better now though, I guess caffeine really is bad for you! That Quarkini looks awesome! And that pretzel! Holy hell it looks fantastic. 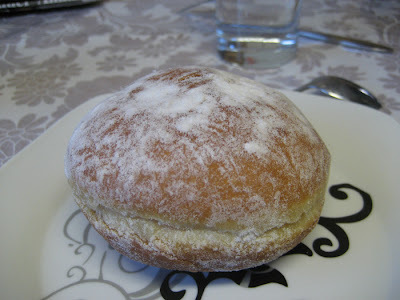 As we like to say in America, "Ich bin ein Berliner!" That food just looks ridiculously amazing. When I was in Berlin it was the end of my trip so I was too low in funds to really splurge on food...good thing, too it would seem or I would have gained 40 kilos! There is an Aldi grocery store in Port Huron,MI( border town to Ontario where I shop) and I wasnt impressed. They carried a lot of their own brand name products. I looked it up on Wiki and found it was a german company. I'm sure the Aldi's in germany were a lot nicer. Lisa & Laura - I totally miss the food in Germany! I mean, I think we have a great variety of different foods here, but German food isn't so well represented. It's getting colder, and I could totally go for some quarkinis or sauerkraut or some kaeseknacke! Randi - We've got Aldi's here in Melbourne too; I can't say I'm a *huge* fan. Sometimes they have great deals on, say, fruits or cake tins or cheap prosecco, which I like to get. I don't do the bulk of my grocery shopping there - not enough variety. Apparently in Germany the Aldis often have excellent deals on electronics, which lots of people queue up for! I had my very first Quarkini today and came across this post when I was looking for a way to describe them to my friends back home, lol. They are SO SO SO good!! They taste just like an apple fritter, without the apple...with that nice crispy sweet outside and dense soft middle....mmmmm. They're fabulous, aren't they Bonnie? Must learn to make them at home!